Best equipment to hold together casket side panels. The CBP Casket Box Press is the unique and faster automated side panel clamp. Each of the twelve cylinders allows precise adjustment at all corners. 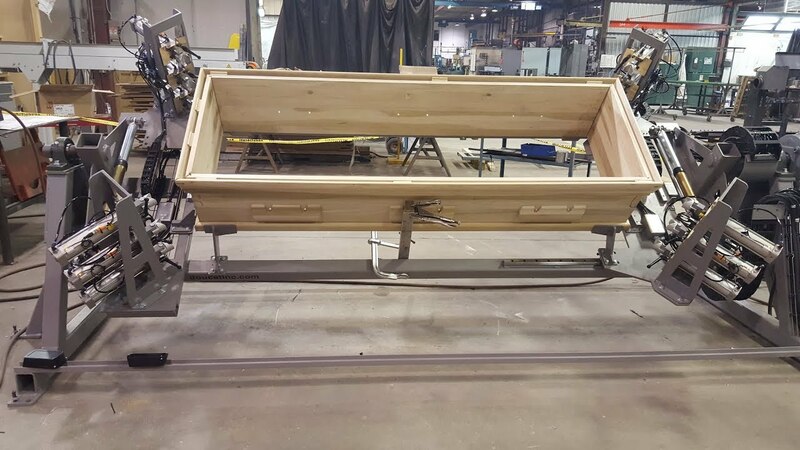 Pneumatic pushers are adjustable in height to adapt depending on body type of caskets. An additional inside pusher is planned for pushing down against the reference for the first part. Operator loads first long piece at the bottom position of clamp and aligns against the three reference points. Parts are loaded with bottom being facing up. Assembly Press rotates back 45 degrees to release piece over a lifting receiving table to unload the casket box. Receiving table lowers down and transfers laterally the casket box toward the roller conveyor out of the assembly press frame.